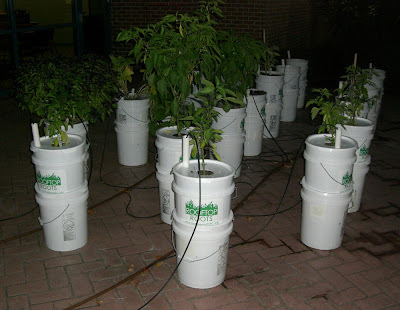 Local nonprofit Rooftop Roots is working with the Arlington Food Assistance Center (AFAC), Arlington County Extension, and Arlington Central Library to demonstrate sub-irrigated planters for growing vegetables. The demonstration garden will produce tomatoes, eggplants, peppers, cucumbers, and beans for AFAC. The sub-irrigated planters are constructed from recycled food-grade containers that local restaurants have donated. Since water is draw from a reservoir at the bottom of the planters, that planters are self-regulating, use water efficiently, and make the plants impossible to over-water. Here's a detailed schematic and construction instructions for the planters. Rooftop Roots offers great hope for effectively expanding the supply of farmland and fresh vegetables in Rosslyn. With Rooftop Roots, you can now turn your roof green and productive at relatively low cost.